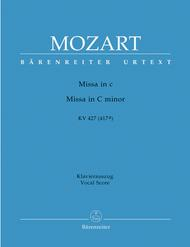 Missa In C Minor, K. 427 (Credo and Sanctus, reconstructed and completed by Helmut Eder). Composed by Wolfgang Amadeus Mozart (1756-1791). Edited by Helmut Eder. For 2 soprano solo voices, alto solo voice, tenor solo voice, bass solo voice, SATB / SATB double choir and piano accompaniment. This edition: Paperback, Urtext edition. Paperback. Classical Period and Sacred. Difficulty: medium-difficult to difficult. Vocal score. Choral notation, piano reduction and introductory text. K. 427 (417a). 112 pages. Duration 55 minutes. Published by Baerenreiter Verlag (BA.BA4846-90).ISBN 9790006456932. With choral notation, piano reduction and introductory text. Classical Period and Sacred. 7.5x10.5 inches.